ASIDE from the radical left and their ISLAMIST cohorts, a goodly portion of Americans are not interested in submitting to Islam. Most patriotic Americans will attest to the same. MOVING right along…a preponderance will also accept the premise that there is NO other group as intrusive, arrogant and bullying as Muslims. Yes, it’s a package deal with their commitment to Islam. Territorial…part and parcel. This is the G-d’s honest truth, even if many are afraid to voice it. IN this regard, ISLAMIST designs are exposed through several intersecting factors. Thus, an understanding of their underlying/unifying basis will set much of the (frightening) record straight. IN the main, many Americans are not used to others encroaching upon their territory, unless (unfortunately) confronted with the criminal-bent. In other words, live and let live, that’s the general motto. ON the other hand, home invaders and robbers don’t exactly ask for permission, they just storm right in. Now, if a family is fortunate enough to own a firearm (or two…..), some will be lucky enough to stop the criminal in their tracks. Dead to rights. Others, if unarmed but still able to escape with their lives, will seek out the justice system for recovery of this and that. SIMILARLY, akin to Europe’s (seemingly) rapid ISLAMIZATION (actually, harking back to the Euro-Arab Axis, a secret deal from decades ago which many Europeans are still in the dark about), America is transforming ala the same “process”. However, the main difference between the two thrusts are the ways in which the Muslim Brotherhood catapulted into America’s power centers. Indubitably, it sped up the “conversion” process, as repeatedly noted at this site. IN this regard, to internalize how America is quickly becoming a “captured” nation, look at the manner in which ISLAMISTS abuse two core underpinnings of America F/B/O Muslim supremacy. ABSOLUTELY, freedom of religion is held sacrosanct, as is freedom of expression. So what better way to upend – bully like – both, other than to stand these American principles upside the head? IN the main, most westerners are terrified to interject into areas concerning religious houses of worship, even though mosques are breeding grounds for terror and the takeover of America. Europe alike. A double-edged sword. BUT just because western houses of worship are used as spiritual sanctuaries, we must internalize that mosques are not utilized/viewed as such, even though adherents “religiously” prostrate before (their pagan) Allah on a regular basis. On the whole, they are their barracks to carry out the war-like basis of ISLAM! IN relation to their abuse of freedom of expression, the facts more than back up said claim: CAIR, the major mouthpiece for ISLAMISTS in America, exhorts Americans to “shut the hell up”…or else. 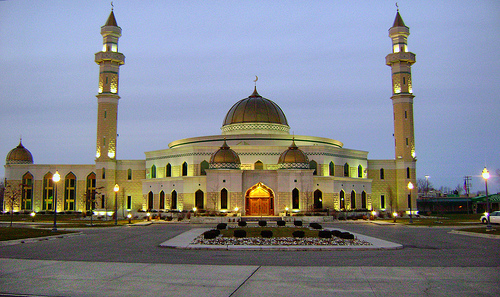 IN no uncertain terms, the surge in mosque construction in the U.S. has everything to do with the parallel Shariah adherence of the ISLAMIC community. This is deadly – for America! AS a recent exhibit attesting to the aforementioned, let’s use Boston’s blow up: there is an absolute connection…clear linkage… between the (April 2013) terror attack at the marathon and Boston’s Wahhabi-based mosques. No doubt. NOT to be overlooked, the Brotherhood’s student arms, the MSA and MSU, are terror-tied and are found all over America’s campuses. They played a key role in Boston’s bombing too! For the record, Cambridge (a Boston outlying ‘nabe) is a leading epicenter for jihadi activity. Yup. AND to revert back to 9/11/01, its desecration is directly related to stealth jihad via mosques. Absolutely. IS it any wonder that counter terrorists realize that mosques are “religiously” garbed to plot jihad? MORE specifically, what about the tie-ins to ISIS via U.S. mosques: Siraj Wahhaj and his Brooklyn based terror mosque, as just one citing! Head spinning. BUT added into the deadly mix, ISNA, the Brotherhood Mafia’s largest hydra in America (and the continent), is up to its neck in beheading…mosque-wise! No kidding. AS to the bullying charge (found in the opening statements) aka “in your face”, what better way to assert hyper-muscle than to take over PUBLIC spaces (below are “typical” scenes from NYC) and co-opt them into prayer spaces? O M G ! NOW, it must be understood that an underlying component to their encroachment into the public sphere has everything to do with staking out supremacy. When is the last time that millions of devout Christians (Jews too) took over sidewalk after sidewalk, avenue after avenue, to pray? Never and never. 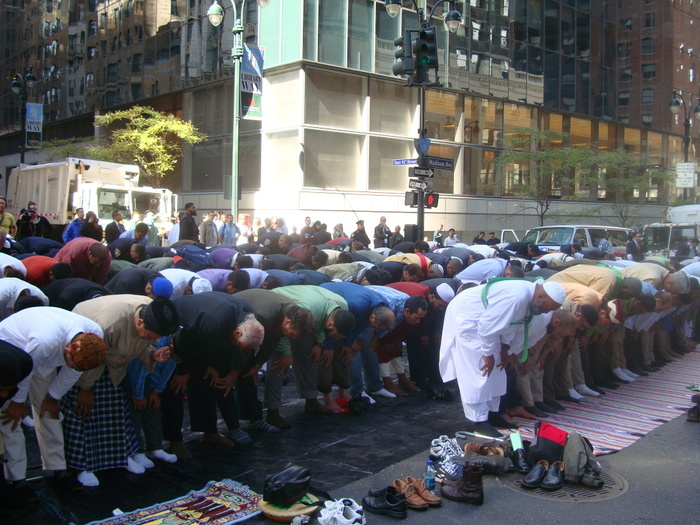 SIGNIFICANTLY, sidewalks are NOT the exclusive domain of Muslims. They belong to one and all. However, ISLAMISTS know that Americans (westerners) will NEVER stop them from violating the inviolate separation between public and private spheres. BASICALLY, arrogant supremacists are incapable of “sharing” public spaces, and herein belies Islam’s thrust: submit to Islam, like it or not. Most (hopefully) know that Islam means submission! It is not for nothing. 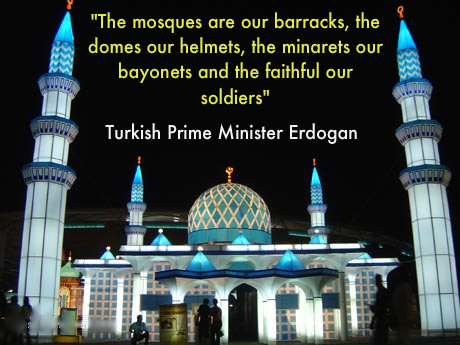 YET, along the same invasive thrust, minarets on their mosques (in every part of the world…the BIGGER the better) serve as symbols of triumph and supremacy. This is a fact. BUT before you read the latest MEGA thrust into the public – albeit mall – sphere, please recall intersecting commentaries, re this same Somali “area of concern”, ala jihad and malls alike. Yes, U.S. jihadis hiding in plain sight….ISIS/Al Shabaab threatened to attack U.S. malls…Minnesota’s Mall of America is a chief target! RESULTANT, view the above – in tandem with the following – as the sum of the parts, so to speak. Minnesota has “Somali malls” and now at least one of those malls has a large mosque. Muslims forced a mosque into a retail mall in Georgia too. America is losing its identity as Muslim colonizers take over entire areas. via Growing Somali mall in Minneapolis now boasts one of the state’s largest mosques | Star Tribune. Construction of the metro area’s newest mosque involved a shopping trip to the Middle East, some back-and-forth with the city of Minneapolis and a reported $3 million investment. But developer Basim Sabri says setting out to build one of Minnesota’s largest mosques at his Karmel Square mall wasn’t a vanity project. Instead, the space — part of a major expansion at Karmel — was meant as a goodwill gesture to the local Somalis who rent and shop at the south Minneapolis mall. The expansion has tested Sabri’s famously tense relationships with the city and the mall’s neighbors, who have voiced concerns over parking and traffic issues. Part of the construction collapsed in May, cutting off electricity to the neighborhood and briefly stalling the project. The space is on the newly added third floor of the state’s oldest Somali mall, where shops sell long skirts and scarves, henna tattoos, jewelry, handbags, rugs and Somali specialties such as savory sambusa pastries. He claims the new mosque is the largest in Minnesota, possibly even the Midwest. But the imam of another new Twin Cities mosque, Darool-Uloom, which moved into a former Catholic church on St. Paul’s East Side last summer, says it handily surpasses Karmel’s square footage to claim that distinction. There, Imam Sheikh Hassan says the men’s prayer hall alone covers about 15,000 square feet. Metro Islamic centers such as [jihad-recruiting] Al-Farooq Youth and Family Center in Bloomington and Abubakar As-Siddique in Minneapolis are larger overall, but their prayer spaces are more modest than Karmel’s. Like some of Sabri’s other projects across Minneapolis, the mall expansion has drawn a measure of controversy. When newly installed trusses collapsed and knocked down a third-floor wall in May, some neighbors said they had raised concerns in vain about what they saw as shoddy construction. Nobody was hurt. “When the accident happened, I was so angry because it could have been prevented,” said Raymond Hoffner, the outgoing president of the condo association. “It’s fair to say there have been some concerns on both sides of the fence,” said district supervisor Bill Smith, though he and Sabri both say the process was more cooperative this time around. INTRINSICALLY, without IMMEDIATE push back, one must recognize (and admit) that the situation will worsen, and to an exponential degree. Besides, basically, ones silence translates into agreement, even if a peep is never heard that one hasn’t even given permission for this and that. It becomes akin to a “too damn bad on you” outcome. INHERENTLY, America will no longer belong to ALL of America’s legal (emphasis placed) citizens, except Muslims. This will absolutely be the result, if the situation continues down this dangerously intrusive, arrogant and bullying trajectory. TRUTH dare be told, those who agree with the above analysis but sit the fight out, well, they will only have themselves to blame. The national consequences are duly anticipated; the ISLAMIST handwriting is on the wall. Not only that, at this juncture there are millions more patriots in America, in comparative numbers to Muslims, as such, what’s the hold up? THE overriding question becomes: how can patriots allow their nation to be turned over to Shariah-compliant ISLAMISTS, one state, city or town at a time? So, if patriots in Minneapolis, as a recent example – and surrounding areas – believe that Muslims “deserve” special privileges, just ‘fess up and do nothing. Otherwise, take a stand!! This entry was posted in Uncategorized and tagged 9/11/01 and mosques, “Somali malls”, Boston's Wahhabi-based mosques, CAIR, Euro-Arab Axis, http://joeforamerica.com/2015/03/islamization-america-euro-style-takeover-via-imploding-mosques-patriots-say/, ISNA, MEGA mosques, minarets, mosques are "religiously" garbed, MSA and MSU, MUslim Brotherhood, Shariah adherence, Siraj Wahhaj by Adina Kutnicki. Bookmark the permalink. Pingback: Israel's Voice | The Islamization Of America: A Euro-Style Takeover Via IMPLODING Mosques & More. Patriots, What Say You? I have read from very credible sources about the Latin American drug cartels-MS13-Hezbollah nexus. Thank you so much. Also, thank you for your courage to take a stand to save our Western Civilization from the clear and present danger of the jihadists. Okay, here’s the thing: what we do know is that HUSSEIN Obama doesn’t have America’s back. Ditto Russia. By extrapolation, the question becomes: is it more, or less, likely that the outlined scenario at DC Closeline (btw, my commentaries have been re-blogged at DC) is true or not? Thanks so very much for your insight! May the God of Abraham, Issac, and Jacob keep you and protect both you and your family. like those giant houses- apt. buildings springing up all along highway 1 or 60 & down south, They look empty FOR NOW.